Hi guys! I've got a celebratory manicure for you today for two reasons! One: my pinky nail is finally long enough to come out and play again, and two: it was my birthday last Friday and this is what I wore for my birthday party! It's also got a new polish (new to my collection at least) so I am killing multiple birds with one stone today. So for my birthday I wanted my nails to go with the new top I bought to wear for my party (I like to match!). The top was a dusty olive green, so I wanted something like that, but not just only that (I don't like to match everything 100%). 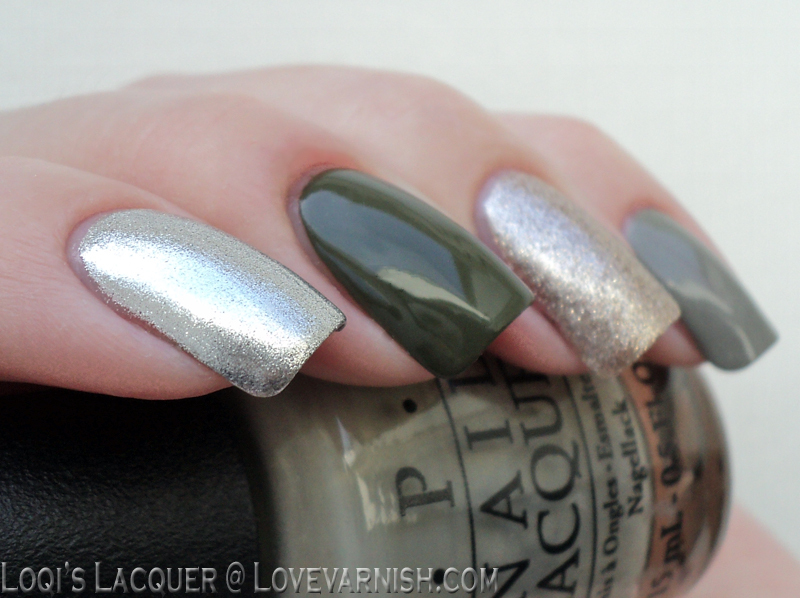 So I went for a skittle manicure with two kinds of olive green and silver and gold for some festive bling! On my pinky I am wearing OPI Suzi takes the wheel, my middle finger and thumb have got China Glaze Westside warrior on them, on my index finger I have Sinful Colors Heavy metal and my ring finger is sporting my new polish: Essence On air!. On air is a lovely cool toned gold polish. It's so sparkly it looks like a glitter, but in fact it's a very dense shimmer, almost like a foil. Shown here is 3 thin coats with topcoat. I hope you guys enjoy this manicure and see you next week!